The Daily Transcript’s final edition of Soaring Dimensions, a special annual publication that highlights all the new and ongoing construction projects happening around town. 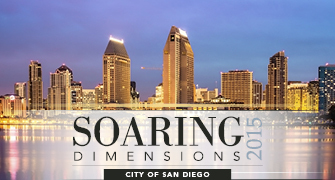 This section focuses on the city of San Diego, from UCSD's new medical facilities to the apartment boom downtown. The restoration and expansive redevelopment of Horton Plaza won’t be completed in time for the 105th anniversary in October of both its iconic fountain’s unveiling and the grand opening of the historic U.S. Grant Hotel across the street ­-- as was planned just a few months ago -- but officials still hope to celebrate its public re-opening by sometime in December. For Dr. Scott Lippman, director of the UCSD Moores Cancer Center, the future for research and treatment is bright thanks to two significant expansion projects on the local horizon. Despite some opposition from the community and a delayed start, Minneapolis, Minn.-based Target has set the opening of a TargetExpress in South Park for Oct. 7. If you ever thought skydiving was too expensive or dangerous, then Airborne San Diego might have the solution for you. With the first phase of construction for a new indoor shooting range facility at the Navy’s Silver Strand Training Complex South completed in March, work on phase two kicked off in July. With the transformation being dubbed a “retail resort,” Westfield UTC is in the midst of a $500 million revitalization. San Diego's downtown skyline temporarily lost a landmark this summer as a construction crane removed the long-faded 2,000-pound neon sign for the Hotel Churchill, bringing it down from the seven-story perch where it had stood since the eve of World War II. Anyone who's visited downtown San Diego recently can't help but notice the construction cranes that dot the skyline. A number of the cranes are at hotel construction sites; one of those hotels is scheduled to open this fall and two more will open next year. With each passing day, San Diego-based Sudberry Properties’ 230-acre Civita development at the northern end of Mission Valley looks less like the rock quarry it has been emerging from, and more like a community. In general, parties to a contract can rescind, or unwind, the contract when it was consummated based on mistake, fraud, duress, or undue influence (Civil Code § 1689(b)(1)). When a contract is rescinded, whether by agreement of the parties or by the court, the contract is essentially treated as though it never came into existence and the parties are placed in the position they were in prior to the contract. Demand for design activity in the West has now increased in back-to-back months for the second time this year as architectural work is picking up, according to the American Institute of Architects’ Architecture Billings Index released Wednesday. In a vote tied more to sentiment than the merits of its bid, the San Diego Board of Port Commissioners gave Anthony's Fish Grotto restaurant a stay of execution Tuesday, allowing it to compete for a renewal of its longstanding lease on the waterfront against a pair of competitors bidding to replace it with gleaming new structures designed to attract more visitors. Major metropolitan areas in California saw more than 4,000 projects, valued at $14 billion, go out for bid in the second quarter -- and San Diego came up with a good share of the transactions, according to a BidClerk survey. Civic San Diego’s full board voted on Wednesday to recommend that the City Council enter into two separate exclusive negotiating agreements to develop two mixed-use projects on Market Street. MISSION VALLEY– A $150-million renovation on the 1,410-unit Village Mission Valley Apartment Homes in San Diego has been completed by the Irvine Company.